Anyone who wants to become closer to God through Jesus Christ with an open and pure heart are candidates for writing/painting an icon. In fact, the less artistic experience one has the better. You begin with a fresh slate. My intentions for teaching bear witness in the hopes of bringing all students into the beauty of a transcendental journey opening to them the secret scope of being in the mysteries of Christ. Life is filled with saga’s both joyful and painful. On a personal note here, I myself have been struggling the deepest amount of pain that my life has brought forward in these last two years. I have not had the energy to write spiritual contemplations in my newsletters, except beyond for the schedules of events taking place to support icon classes. Some of the painful journeys in my family must remain private, but what I can share here is that the physical strength of my work as an iconographer has been challenged by a broken femur for the last year now. The healing is incurring a non-union and at this point after 4 surgeries to promote healing and applying plate after plate, the dr.’s are turning to faith and hope that complete healing will take place in the allowance of time. On the other side of the coin, I feel I am painting and teaching with greater spiritual strength as I continue to submit to that which I know I can’t control. I BELIEVE, and I believe my work will not ever deny me, the gift of iconography in the grace of the Holy Spirit truly embodies the Church as a Hospital and the Hospital as a Church. The greater the struggle, perhaps the greater we can open ourselves to one another communicating our personal mysteries giving birth to aesthetic conceptualism, discovering the symbols as one of its most valuable resources. The article on symbolism brings forward this concept by Rainer M. Rilke,”I live my life in concentric circles that opens on the things. I will not be able to close the last one perhaps, but I will have to try. Around God, antique tower, I turn and turn by millennium: I do not know still if I am storm, hawk or great canticle”. In other words, this refers to our cognitive life revolving around the mystery of God. Symbolic language is the first expressive means to man. For instance, as life becomes so filled with distraction and heaviness, the return to the simplicity and primordial language of the children becomes a strong healing source and a desire for man. Children speak a universal language, uncomplicated and joyful. 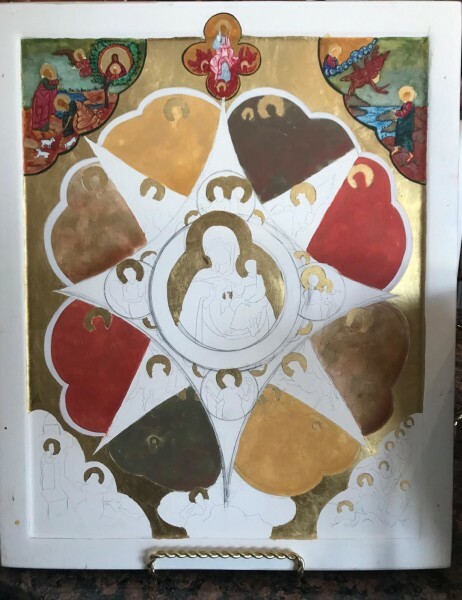 The icon of our 2018 summer egg tempera session in progress for the summer 2019 and filled with many, many symbols for interpretation in context.